TestScribe is a tool designed to export various sections of a Visual Studio 11 test effort to a Word document. Note: - If you are using Visual Studio 2012 Update 2, then use the updated version of test scribe from here. 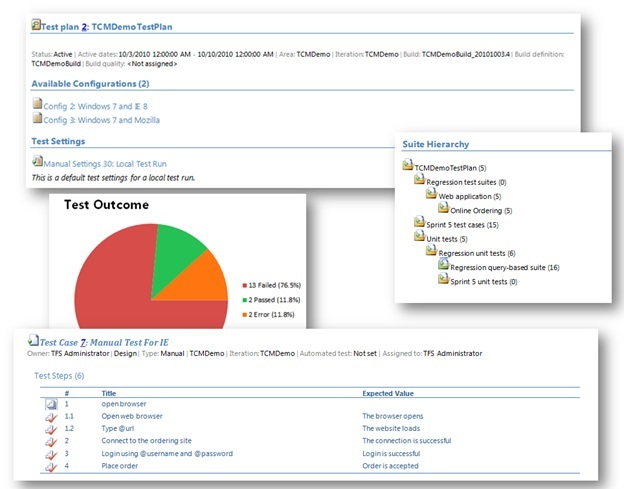 Test Scribe is a documentation power tool designed to construct documents directly from the TFS for test plan and test run artifacts for the purpose of discussion, reporting etc. Test Scribe needs to be installed as an add-on power tool to Microsoft Test Manager (MTM) which is included in Visual Studio 2012 Ultimate, Visual Studio 2012 Premium and Visual Studio 2012 Test Professional Editions. Download Test Scribe and run the setup on the machine where MTM is installed. From the “Test Plan Summary” section, you can select a particular test plan, right click and select “Generate”. This will generate a document for the selected test plan. The generation time will vary depending on the connection speed, amount of data and machine configuration. The output document will contain (among other things) the test plan details, the suite hierarchy and the set of test cases with test steps inside each test suite. From the “Test Run Summary” section, you can select a particular test run in the connected test plan, right click and select “Generate” to create a document for the selected test run. The output document will contain the test run details with pie charts displaying test outcomes and test failure analysis. 1. Enables support for connecting to Team Foundation Server 2012 and Team Foundation Server Hosted to generate the Test Plan Summary or Test Run Summary report. a. Fixed some crash issues. b. New Test Scribe does not require separate installation of Team Explorer since Team Explorer is now bundled with Test Professional. c. Fixed some issues with formatting. contents of the document. This will then open the document in Office 2007. The same problem is not found in Office 2010. 3. Generated documents are stored by default in the “My documents” folder. The output path of the generated report cannot be modified. 4. Exporting word documents for individual test suites or test cases in a test plan is not supported. 5. In case of TFS 2010 test cases having "<", ">" in test steps and upgraded to TFS 2012, the test steps formatting gets corrupted. Test Scribe fails to generate a valid document for plans having such test cases.To fix the issue, this tool can be used. Once the corrupt test cases are fixed, Test Scribe works fine.